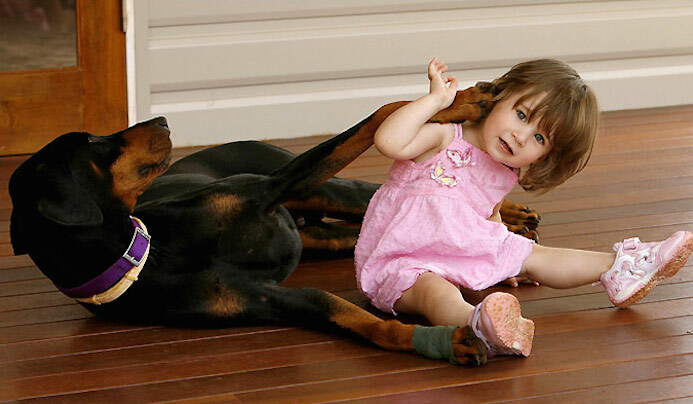 In 2007 a Doberman Pinscher named Khan was rescued from an animal shelter. Just four days later he would save his new owner’s baby girl from a deadly snake attack. On the day of the incident, seventeen-month-old Charlotte Svillcic was playing in the garden of her home in Atherton, Australia. At first Khan began acting strangely, it seemed as if he was being slightly aggressive towards Charlotte, attempting to push her away from where she played. The fact was, Khan had spotted a King Brown snake, the world’s third most venomous snake and he was trying to nudge her to safety. As the snake was about to strike the baby girl, Khan did the most heroic thing. With baby Charlotte clear, Khan ended up taking a venomous bite to the paw himself. After being bitten, Khan ran inside and collapsed. He was given a shot of anti-venom by a vet and spent a night in a lot of pain but managed to survive and eat a large breakfast the next day. Catherine said that the family was incredibly moved by Khan’s selfless and protective act. Catherine also explained the condition of Khan when he was rescued by Kerry Kinder (Doberling Boarding Kennels owner). He was starving, had broken ribs and had been beaten. “He was an abused dog. It was borderline on whether or not he should be put down because he was in such a bad way,” she said. In contrast to the treatment Khan endured before his rescue, Catherine said he would spend the rest of his life in luxury. An Atherton snake expert told local press that Khan may have escaped death because the snake was not able to inject a large amount of venom into his paw. The story would have been very different had the bite pierced the skin of little Charlotte. The dog who had been unwanted just a week before was now “Khan the Wonder Dog” to his owners. They knew for certain he had saved their daughter’s life by risking his own.